There’s a new kid on the block: a six-year-old Afghan Muppet named Zari. 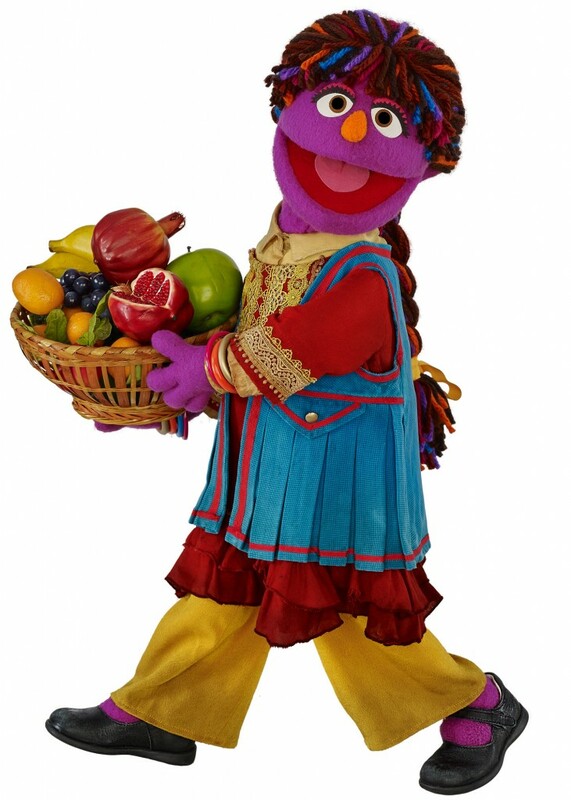 She’ll appear in the fifth season of Baghch-e Simsim, Afghanistan’s version of Sesame Street. Sesame Workshop says Zari is being introduced to focus on girls’ empowerment in Afghanistan, where 85 percent of women have no formal education and the literacy rate for women is 24 percent, one of the lowest in the world. In addition to interacting with children on the show, she will interview Afghan professionals. In one episode, Zari goes for a check-up and asks her female doctor what it takes to become a doctor because she may become one someday. 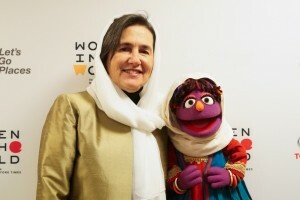 “Debuting a confident, inquisitive, and sweet Afghan girl character is a perfect opportunity to engage both boys and girls with lessons supporting girls’ empowerment and diversity as we aim to help all children in Afghanistan grow smarter, stronger, and kinder,” Sherrie Westin, Sesame Workshop’s Executive Vice President of Global Impact and Philanthropy, said. She has several different outfits, each a blend of styles from ethnic groups in Afghanistan, and with her school uniform, she wears a cream colored hijab, or headscarf, as required by all young female students in Afghanistan. The program is a co-production of Sesame Workshops in New York and a local production company in Afghanistan, with some funding from the U.S. government. It has aired in Afghanistan since 2011, but until now, the program has consisted of voice-overs covering international versions of Sesame Street, with the addition of short live-action sequences filmed on location in Afghanistan. Last fall, the team started talking about introducing an Afghan Muppet, executive producer Jawed Taiman said. After they decided to move forward, the Sesame Street production teams in the U.S. and Afghanistan worked together to develop a character that would appeal to people from a range of backgrounds. “Our education and production teams shared lots of information on girls in Afghanistan and our audience. We exchanged photographs and research material and decided the character should come from a middle income family, appeal to rich and poor, be bubbly and very curious,” Taiman said. 23-year-old Mansoora Sherzad, an arts and music major at Kabul University, is Zari’s main puppeteer. Out of a casting call of 150 young women, Sherzad — who has theater experience but has never worked as a puppeteer — made the final cut. Sherzad, will voice Zari in Pashto, and another female puppeteer will voice her in Dari. It took two months for them to learn how to operate the Muppets. Trainers from Sesame Workshop’s New York headquarters came to help train, and the women traveled to India for training at the Indian version of the show. Sherzad, whose mother teaches Dari (an official language of Afghanistan) at a public school in Kabul, said she was grateful for her schooling and that many women face obstacles to earning education in Afghanistan. Being a female puppeteer in Kabul is not without risk for Sherzad. “Generally we are in danger in Afghanistan because we are girls. It’s hard to go to work with men all around us. At first I didn’t want to tell people I work with the puppets, and I didn’t want to give the media my photo but I decided I have to be brave. Sometimes when I’m walking in the street somebody points and me and says ‘I saw her on Facebook or online,’” she said. Afghanistan has one of the world’s youngest populations, with a median age of 18 years old. But Felbab-Brown said it is hard to gauge how many people will be able to see the show. Cell phones are widely used in Afghanistan, but televisions are not, especially in rural areas. Sherzad lives at home with her extended family of seven, including her mother, father, two brothers, her sister-in-law, her niece and her grandma. She says the brothers were not initially on board with her decision, but now they’re fully engaged and giving her all their support. Before Zari hit the Afghan airwaves, the Muppet took a trip to New York City, home to the original Sesame Street, where she met First Lady of Afghanistan Rula Ghani. Sherzad wasn’t able to travel to New York but hopes to meet the First Lady someday in Kabul, she said.